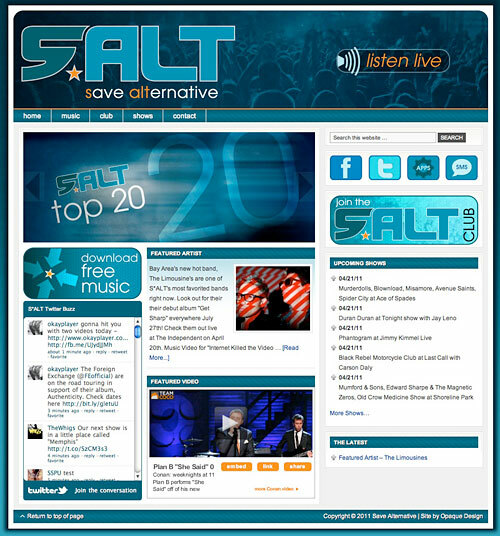 Web site design for Save Alternative. Save Alternative is a radio network and online music community focused on alternative music. The goal of the site design was to present a lot of content – news, featured artists, videos, and concert listings of new and upcoming artists – in a concise format with a modern, minimalist design. We chose to utilize the WordPress platform to allow the editors to easily add and update content. This project was especially enjoyable for us to develop, as we grew up during the rise of alternative music in the ’80s and are still into it today.